Site down, avoid for now. See our recommended Bitcoin casinos. Site is down, avoid for now. Sleek looking and exceptionally functional Miami Vice Casino is inviting to new and experienced players alike. The obvious hook is the use of Bitcoin for conducting all transactions to and from the casino – anonymity and instant transfers are the key. You can enjoy playing a host of available casino titles at Miami Vice, including well known categories such as table games, slots, video poker and more. The casino is also one of the few Bitcoin casinos to regularly host live games. The rest of the offer is no less impressive with an inviting welcome bonus for new players, secure banking and competent customer support. Playing at an online casino has never been easier and at Miami Vice Casino, Bitcoins will let you play and withdraw your winnings in minutes. Simply follow the simple, three step instructions: create a Bitcoin wallet, purchase Bitcoins with a credit card or other payment method and make your deposit. It is that simple. Blackjack – Engage in the always entertaining action of Blackjack while playing one of the 17 variants at Miami Vice Casino, including Mini Blakcjack, Pontoon Blackjack, Super 7 Blackjack or Face Up 21. Video Slots – The largest collection of games at Miami Vice Casino is led by the mega popular “Mr Jack” 3D slot, though other titles might tickle your fancy like Temple Cats, Aztech Idols or Dragon King. Roulette – Spin the wheel at the 9 different titles available in this category led by Live Roulette Table 2, American and Euro Roulette. Table Games- When it comes to table games, Miami Vice Casio doesn’t disappoint by offering 28 varied titles. You can play Pai Gow, Let it Ride, Bacarrat or the exciting Red Dog to name but a few. Video Poker – Poker fans can indulge themselves by playing a plethora of video poker variants at Miami Vice Casino. The library includes 27 titles like Double Joker Poker, Five Draw, Poker, Aces and Faces and more. Keno – Last but not least, Keno is represented in four varieties: Instant, Traditional, Krazy and Klub Keno. Each is more exciting than the last. Organized and held on a daily basis, the live games at Miami Vice casino are a real treat to players who prefer the personal touch in online gaming. The offer extends to include live casino games, dice and lotto. The games are hosted by attractive dealers and feature the standard roulette, blackjack and poker. You need to log in in order to place a wager. This is a popular dice game variations based upon the famous Bitcoin dice game. Players can place wagers on the outcome and the win ratio depends on the wager. This 5 out of 36 lotto variants is excellent for players who like to engage in live games, with instant access provided by Bitcoin. Create a valid Bitcoin wallet address – The casino has a simple step by step procedure which explains everything you need to know about this online cryptocurrency and where to get your Bitcoin wallet. Register- Once you have obtained your Bitcoin wallet, register on the casino’s website. There is only the need for a username, password and an email. No personal information required. Make a deposit – Place a deposit at your preferred game. Once you do so, contact the site’s customer support and they will add the bonus amount to your account. The welcome bonus is equal to 100% match of your initial deposit up to 1 BTC (1000 mBTC). Miami Vice Casino’s games have been tested fair by the TST and have the certificate for this esteemed regulatory body for fairness. Some of the games on offer like the lotto and dice games are also provably fair, meaning you can check for authenticity of the results with the assigned digital code. 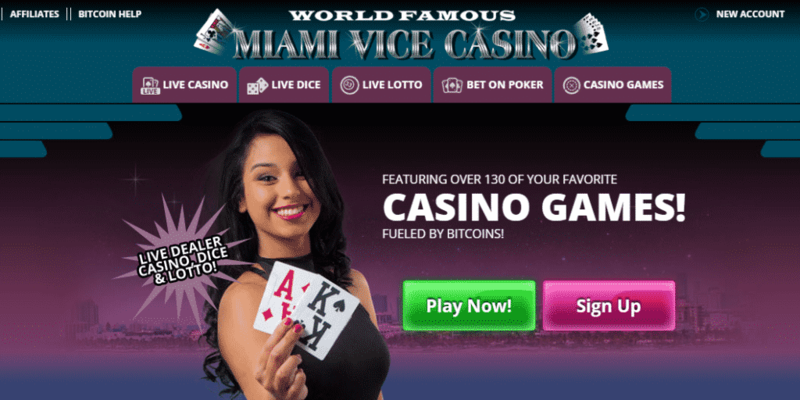 Not to be mistaken for the movie/TV brand of the same name, Miami Vice Casino is at the peak of the Bitcoin casino offer. With excellent games from several softwares, inviting welcome bonus offer, live games and secure transactions using Bitcoins, it is a great place to start off your gaming pleasure.